I have an affinity for ships mentioned as lost in the canon shows, but we have never learned what really happened to them. If anyone has a suggestion for a ship that should be included in my planned series, please do let me know! However, limit yourself to the TNG+ era since that is where my interest lies predominantly. In the 7th season STTNG episode "Interface" the U.S.S. Hera under command of Capt. Silva LaForge was declared missing without a trace. In the 5th season STVOY episode "The Fight" Voyager encounters a phenomenon called chaotic space in which the "laws of physics are in a state of flux". Voyager managed to escape, but Chakotay theorizes about the unresolved disappearance of several Starfleet vessels over the years. So this is what I was trying to do; show the Hera caught trapped in chaotic space in a state of flux, phasing in and out of the normal space-time-continuum which is why it could not be found. The ship's power eventually depleted, drifting dead and cold in space. Background: Starfield created in LW by myself via texture environment. Meshes: Nebula class by Flat Eric. Composition: Scene and lighting setup in LW, final composition in PS, including 'chaotic space', blurs and warps. Added slight blue-ish tinge and grain for TV effect. 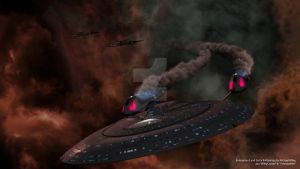 Additions: Modified the registry of the Nebula class to match U.S.S. Hera. Uniform pip in title is my work. Original size: 2000x1000 plus frame. Total time approx. 8 hours incl. render time and 70 layers in PS (following update). In Non-Canon it was determied that the Hera came across a "Trans-Slipstream" which is basically a natural version of the quantum slipstream drive, a few months after being stranded Silva was Killed in a landslide accident, Later on in the 2380s Geordi Visited his mother's grave I'm guessing to say one last goodbye. Was that in one of the official Trek novels? Or are you referring to fan-fiction? Interesting twist though, either way. It's in the Official novels. DO you know which one? I obviously have missed one with an important revelation. Thanks. Well, I'll see if I can grab it and give it a read. Sounds interesting enough, especially bringing that scientist back (didn't have to mention where the name was from, by the way ). I just mentioned it in case you get a Brain Fart. No worries, I know; thankfully that doesn't happen all too often in relation to Star Trek. Thank you very much. Tried a few angles before deciding to use this one. Glad you agree on my choice! I agree, they ought to have done more with it, especially since it was LaForge's mom's ship. Beautiful render though, always like the Nebula class. Yeah, I agree. And yes, of all designs based losely upon the Galaxy class the Nebula class retains the majestic form, even if more compact. Indeed, it's one of my favorite ships in STO right now. Ah hehe, I've not played that. Well why not!? Mostly kidding, only reason I can even play it at the moment is because when it came out I splurged and bought the lifetime subscription, otherwise I'd be bored and likely more artistic. Which might not be a good thing. Well for a start, because I'm slightly annoyed what they did with the game. In the early days they had this grandiose idea to literally build an entire Galaxy class ship, all sections and departments that were never seen in the show and you could choose to be part of the crew and work your way up so to speak with achievements and whatnot as you would in real career. Of course that would have been interesting logistic wise, but there could have been more ships or starbases and you could have been assigned at random. But it would have been cool to roam freely on a starship, as you can do in other MMORPGs (like World of Warcraft where most regions are accessible). They could have limited it by "security clearance" etc. The concept went down the drain when the developer company changed and I've heard very, very mixed things about it. Bottom line is really, I neither have the time nor the computer system to play it, but that's OK. I actually am more partial to the older games the older I get. Maybe I'll give it a go at some stage, but by the time I get around to it, it's probably already "Star Trek Offline". Yeah, they initial concept of the game was quite nice, sadly they didn't keep going with it. It's still decent enough, and has improved greatly since it released. Well, maybe I'll give it a try one day. In the meantime I will stay old skool and enjoy Starfleet Command III for the umpteenth time.